Easy Halloween recipes for kids give you an opportunity to have fun in the kitchen with your children and create some family traditions and memories at the same time. 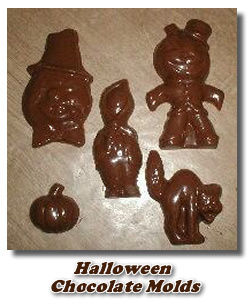 Making molded chocolates is one of the easiest ways to make custom Halloween candy in the exact color and shape that you want. If you've never made molded chocolates, don't be "spooked." The process is simply a matter of melting and pouring. Sure, you can get a bit more fancy if you've got older children involved. One way is by painting in the details of the molds in various colors of candy melts. You'll find everything you need for Halloween molds, chocolate, colored candy melts, lollipop sticks, etc., at Candyland Crafts for the best prices. If this is your very first time making molded chocolates, you can read these step-by-step instructions to help you get started. Here are some other really easy Halloween recipes for kids that don't call for any fancy baking, but are still quite cute and fun. I hope you'll enjoy these ones and take a minute to share your own easy Halloween recipes for kids using the form at the bottom of the page. Turn the cookies upside down. Attach 1 unwrapped kiss to the center of the cookie using a bit of the decorator icing. Decorate the 'hat' by piping a ribbon around the base of the kiss and making a bow. Melt chocolate chips in microwave for 30 seconds. Stir and repeat until melted and smooth. Don’t overheat. Dip marshmallows in chocolate and set on waxed paper. When they are almost set, stack them two high to form the body of the cat. If you’d like to add feet to your marshmallow cat, just cut a marshmallow into smaller pieces and dip them separately. *Recipe and photo from Cooking With Gramma. This is such a quick but cute way of making delicious easy Halloween recipes for kids that everyone will enjoy. Piece of Styrofoam or Styrofoam cups to hold the treats upright while setting. As you can see in the video, these are so easy to make. Simply melt the chocolate in a microwave safe dish for 30 seconds then stir. Repeat, but don't overheat. You don't want to burn your chocolate. If you have a small crock pot, you can melt the chocolate in it but be sure to keep it on low. you can also use the stove with a double boiler if you prefer. Poke the lollipop sticks in the end of the marshmallows and dip or roll them in the desired chocolate depending on what you are making. Use white for ghosts and mummies, green for monsters and Frankenstein, and orange for pumpkins. Poke the sticks into the Styrofoam to keep them upright without touching so the chocolate can set. Refrigerate about 10 minutes. Using some melted chocolate in a bag with the corner snipped off add the faces to your characters. For the Frankenstein, after the green has set, dip the top of the marshmallow in melted milk or dark chocolate for hair. If you have some thin pretzel sticks, you can break off a couple of pieces and poke them into he sides of the head for the bolts. For the pumpkins, after the orange has set, push the lollipop stick all the way through and out the top and add a mini marshmallow shaped like the stem. Paint on some green chocolate to color it. You can wrap the ends in cello lollipop bags and secure them with a ribbon for gift giving or party favors. If they're just for you and the kids, arrange them in the Styrofoam as a centerpiece or in a mug. All the supplies for making these easy Halloween recipes for kids can be found at Candyland Crafts. Listen, I know it's disgusting, but isn't that exactly what the kids love most?! 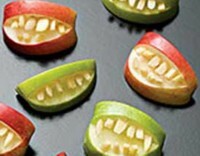 This is such an easy Halloween recipe for kids, but it will bring a lot of laughs to your house. Heat the cheese in the microwave (directions on jar). Allow it to cool a bit. Gradually stir in drops of green food coloring until you get just the right shade for boogers. Dip the ends of the pretzels into the green cheese boogers and give it a twist. Pull it out and wait about 15-20 seconds and repeat. Keep dipping until you get a nice glob of boogers built up on your pretzel sticks. Place the sticks on a piece of waxed paper and allow to set until firm. Here's an easy Halloween recipe for kids that is healthier than all the rest. Don't worry, it's still a lot of fun! Core apples and cut them into quarters. Cut another section out of each quarter from the skin side. (If you aren't serving them immediately, dip the cut apples in lemon juice or orange juice to keep from turning brown - although that might make them pleasantly gory, too). Take pieces of the slivered almonds and push them into the top and bottom of the opening to form grotesque teeth for your monster mouth. *Recipe and photo from Family Fun. 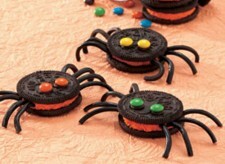 Do you have any easy Halloween recipes for kids that you can add to our collection? Don't be frightened - go ahead and tell us! Special thanks to Betty Crocker, Family Fun, Cooking With Gramma, and All Advents Advisor for their easy Halloween recipes for kids ideas.